Blizzard is monitoring user-made maps in StarCraft 2 more closely than it has for past games, saying it now has the resources to keep a closer eye on things and it's going to put them to use. It looks like Blizzard is paying a little more attention to what's going on with Battle.net than it has in the past if a recent discussion on the StarCraft 2 forums is any indication. In response to a complaint about a deleted map, Blizzard Community Manager "Lylirra" wrote, "While players are encouraged to share the maps they create through Battle.net, published maps are subject to review to ensure that they promote a fun and safe environment for all players." "If a map is found to contain inappropriate content, it will be removed from Battle.net and the map maker will be contacted via email," she continued. "Should a player have any questions or concerns regarding a specific action, he or she is welcome to contact our support representatives." 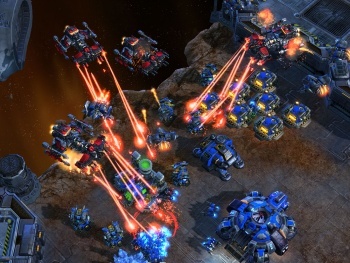 When asked why Blizzard is taking a more aggressive approach toward StarCraft 2 than it did with the original game, Bashiok, another community manager, responded bluntly, "Because we can. Literally. We have a support department now of size and ability to enforce these types of things. It simply wasn't possible when our in-game support used to consist of approximately 20 technical support agents." But he also acknowledged that the process for keeping map makers up to speed is still being tweaked. "We're working on improving our processes to ensure the map maker has more information on why their map was removed," he wrote in a later post. "Right now it is a bit vague and has obviously led to this misunderstanding." Blizzard's "Inappropriate Content Policy Overview" can be read in full at blizzard.com.